Imagine the solutions and energy our city could have if everyone who lived here had access to good healthy food, knew why it was their best option, and took pride in it and their health as an investment in their neighbors and the future. 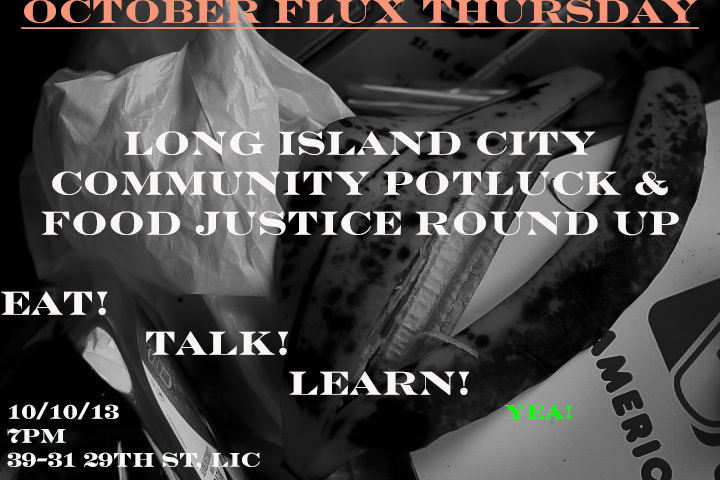 Come celebrate the harvest, share stories and recipes, and learn about what other community members, growers, and organizations are doing to create just and sustainable food systems in Long Island City. Sign up to be a member of the Queens Action Committee brought to you by Flux Factory’s Community Organizer resident Dylana Dillon, the New York City Coalition Against Hunger, City Harvest, and Hour Children Community Food Pantry. Talk land use with Smiling Hogshead Ranch, explore “Integrating Food Production into Green Building – Urban Environments” with Hellgate Farm, find out why kids are getting excited about Sprout By Design, and more! We will be featuring food from local farmers, and beer from local brewers, but please bring a (vegetarian) dish and/or beverage to share. Super gracious thanks to our sponsors! Wednesday, June 20, 7 – 9pm In conjunction with Flux Factory’s June exhibition Bionic Garden, we’ll present Reclaiming Vacant Land for Community Use with Paula Z. Segal of 596 Acres. The 596 Acres project focuses on identifying vacant City-owned property and working with communities on coalition building, political action, and ultimately, influencing the City to turn over control of this property for use as gardens and open spaces. Date + time: September 6th, 6pm - on Location: Flux Factory, 39-31 29th Street, LIC You've gotten yourself into this art opening, but how are you going to get yourself out? The Long Walks Goodbye provides a framework by which to decisively exit: with someone you don't know.